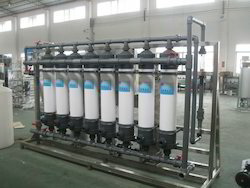 Manufacturer & Exporter of Ultra Filter Plant & Ultra Filtration Plant. Our product range also comprises of RO Systems, Water Softener. We are counted as consistent firm actively involved in offering modern day Ultra Filtration Plant. Manufactured by using modern machinery and cutting-edge technology, these systems are used for recycling of waste water. Rendered by us in various technical specifications, the water recycling systems are known for their consistent performance.